How to measure for siding? This siding calculator is a perfect tool if you're planning to cover the walls or gables of your house with panels - be it wooden, metal, or vinyl siding. In the article below, you will find all the information necessary for such a construction project. We'll start you off with a short instruction on how to measure for siding accurately and determine how much siding you need. We'll also help you estimate the siding cost you're going to bear. Last but not least, we'll elaborate on the most common types of siding and help you choose the most appropriate type for your house. Before you'll get in your car and make a trip to Home Depot, you should consider how much siding you need. As siding is placed on the walls and gables of a house, the whole calculation process boils down to determining the square footage of the area that you're going to cover. Naturally, it's a good idea to subtract the area of any openings (i.e., doors and windows) - after all, you don't want to cover them with siding panels! The dimensions of your wall and gable. In both cases, the most important dimensions are the height and width. The dimensions of any openings - doors and windows. 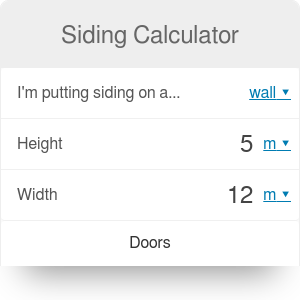 You don't need to do this, as our siding calculator assumes the most popular opening size by default; nevertheless, if the openings in your house are unconventional, you might want to change these dimensions in the advanced mode. The number of openings. You don't need any devices here - simply count them and input the numbers into our siding calculator. The procedure would be analogical if you wanted to paint your house. Area is the total area of siding needed. The waste factor accounts for any waste of material that occurs due to trimming or cutoffs. It is expressed as a percentage of the net wall area. A typical value could be 5-10%; the more complicated the project is, the more waste you are likely to generate. If you're estimating the siding area for a gable, divide the value B * H by a factor of two - this will account for the triangular shape of the roof. To estimate the siding cost, you will need additional information - the unit price of siding. It is expressed as the price per unit of area, for example $/ft² or €/m². Siding is typically sold in squares - units of area measuring 100 square feet. For example, an average box of vinyl contains two squares of material, which amounts to 200 square feet. For this reason, it's important to always pay special attention to how much material is sold in one package, and identify the unit price rather than the price per one square. The last thing to do is write down the total cost of your project and head straight to a store with construction materials! Let's try to estimate the cost of siding for a simple rectangular wall with three openings: two windows and an entrance door. Determine the width and height of the wall. Let's assume H = 8 m and B = 14 m.
Choose whether you want to measure the dimensions of openings, or you will leave the default ones in our siding calculator. We can assume that the dimensions of the door and windows are standard, and there's no need to modify it. If you need to change them, though, simply click the advanced mode button below the calculator. Input the number of openings. In our case, it's one door and two windows. Choose the waste factor. We're going to assume we need to buy 5% more material to account for the trimming. Our siding calculator will use the formula we mentioned above to find the total area of siding. It's equal to 108 m². Input the unit price - we'll assume a price of 18 €/m². Voilà! The total cost of siding material is equal to €1,944. Naturally, it doesn't take into consideration the costs of labor, equipment, or additional elements such as connectors - make sure to include them in your calculations afterwards! A wide range of siding materials is available on the market, ranging from vinyl, through brick and wood, to stucco siding (a traditional Spanish siding). In the following section, we will focus on the most common types. Vinyl siding is by far the most popular type of siding. It is both durable and cheap, what - combined with a wide offer of various colors - make it the most obvious choice. It can easily last 30-40 years, is relatively easy to clean, and can be chosen in many variants, including an option with additional insulation. Its main drawback is that it's not waterproof - if you don't pay enough attention during the installation phase, water can seep behind the panels and induce damage to your walls. Metal siding is also a popular type. It looks stylish, is water-, weather- and fire-resistant. Still, it is considerably heavier than vinyl, what drives up the installation costs. Moreover, it is prone to mechanical damage such as scratching or impact. Wood siding looks natural and eco-friendly, so it's no wonder that many homeowners decide to choose this option. It is the most ecological of all the available options, has excellent insulating properties, and - if damaged - can be easily replaced. However, it is not that resistant to damage; both water and insects can weaken your siding. The maintenance costs are high, too - you should repaint it every 4-5 years. Brick siding is undoubtedly the most long-lasting option - such siding can withstand over 100 years of exposure to bad weather such as rain or extremely low temperatures. It is fireproof, resistant to water and insects, and simply the most durable material on the market. The main drawback is, as you could expect, the cost, along with a high effort required for installation. Siding Calculator can be embedded on your website to enrich the content you wrote and make it easier for your visitors to understand your message.